Marshmallows in hot chocolate was a favorite of mine when I was younger… and not the cheap dried out marshmallow crumbs that come in some packets. I liked real full size marshmallows in my drink. It was always a sad day though when i would have a fresh steaming hot cup of chocolate ready to drink and then get the marshmallows out of the cupboard only to find that the bag wasn’t closed right and they had all solidified into a rock hard blob. I actually like those little stale marshmallows in the packets….but thats just me. Me too Roan, those are actually quite delicious..but nothing can really compare to the giant marshmallows that don’t even allow any liquid drinkage until you’ve eaten most of them..
Biff has all the coolest stuff. NIiiice. I would have eaten the boat before it ever got finished. Btw, you put these things up at 2 am? Yes, you may roast me now. You get a pun point. Today’s comic leaves me with a “Why a boat?” vibe. I would have liked to seen something more logical, despite it being biff and all. Uh-oh, he heard me. Now he’ll use them to make a greenhouse and kill all the plants from lack of sunlight! Curse you Biff! You’ll kill us all one day! Couldn’t be too bad, or otherwise we would see just a pair of eyebrows in the midst of a bunch of stale marshmallows and maybe a hand. You say that, but think of the cereal slingshot, who knows what he could do when challenged? Floating with marshmallows sounds dangerous. for big puffy white things with unreal eyebrows. I :heart: marshmellows. Fluffy, yummy sweets with hot chocolate? What’s not to like? Biff should have eaten the marshmellows. Although building a boat sounds fun, too! 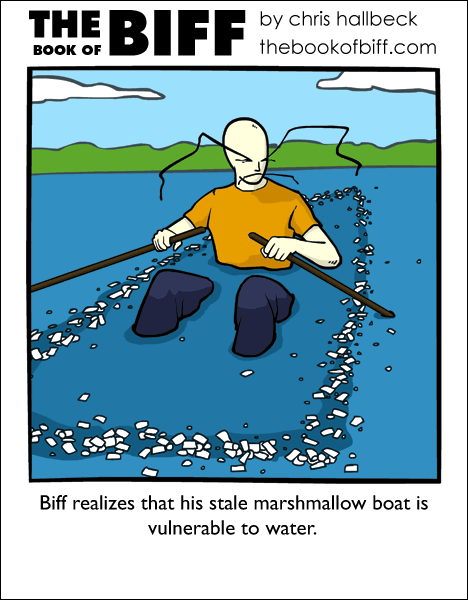 So…if the boat is made of marshmallows…and it fell apart…what is Biff sitting on?! Where does Iceland rank on your reading list? This never would have happened if he’d used stale granola bars. granted, he’d probably would’ve been attacked by squirrels on the way to the lake. I loved going camping when I was a kid, since we always brought lots of marshmallows to roast over the fire. We’d always get impatient and just shove them directly into the flames until we had a black husk filled with gooey marshmallow. Does anybody know a quick way to get $20, aside from selling an organ or two? Wait, I just got it. In exasperation over the stale marshmallows he built the boat! Wow, I commented alot on this one. How the hell do you come up with all these uber-awesome and stupid ideas? just imagine the look on Biff’s face if it was an aeroplane instead of a boat. the lake isn’t shallow as lividfiction says, Biff is in fact sitting on his oars which he made. What happened was, Biff’s opportunity to buy all the marshmallows he’ll ever need at one low price was wasted when he left the top off the silo. He has enough to make a plane tomorrow. I believe the fish won’t be hungry for a while. It looks like the boat has only begun to fall apart, so I think he’s sitting on the boat. Great comic, by the way. Just started reading it today when I saw the ad on Saturday Morning Breakfast Cereal. It’s definitely earned a spot on the bookmarks toolbar. C4Pottery – awesome. Glad you are liking them. I’d like to see Biff doing something perfectly normal, just for the out of placedness. Yes! now I know how to defeat the marhsmallow beast of Bal-duun! mwahaha! Biff was obviously retreating from the rest of humanity forever. Which is why he needed a lifetime supply of his favorite snack, and why pack a basket when you can make your escape craft out of your favorite food? Killing two birds with one stone is obviously very important to Biff. alright, my arm has been twisted. i shall preorder a biff book. i have to find 20 dollars and someone with a credit card, first. but biff shall be mine in the physical world! I love marshmallows. Even the stale ones are fun to eat. And judging on how far Biff is in the lake the boat must have stayed a float for atleast a little while. Upi are scaring me comlpetly. I’d get one, but I can’t afford it lol. Btw, nice guest comic at Diesel Sweeties. my god krasno! do u live in like siberia or some desert island in the pacific???? damn me and my need to read posts backwards!!! Don’t put marshmallows in the cocoa BEFORE putting the cocoa in the microwave, unless they come with. Hehe…the perspective in this one makes it look like Biff’s boat stretches all the way into the horizon! I was so sad when I realised that regular marshmallows aren’t vegetarian! (They have gelatin in them.) When I can’t afford Sweet & Sara, I make do with marshmallow fluff. Mmm…. fluff! I love marshmallows… especially the Jet-Puffed brand giant marshmallows. Those things are the size of a small child’s fist. marshallows have all the vulnerable, all of it,there none left for anything else.